Rea, J.e. and Jeff Scott. "Manitoba Act". The Canadian Encyclopedia, 12 September 2017, Historica Canada. https://www.thecanadianencyclopedia.ca/en/article/manitoba-act. Accessed 18 April 2019. Beginning in 1670, the Hudson’s Bay Company (HBC) held legal control over all lands whose waters drained into Hudson Bay. Known as Rupert’s Land, this territory included all of current day Manitoba. The HBC’s policies in the region included limiting the number of white immigrants who could settle in the area. The Métis population, as a result, became predominant. The Métis were the offspring of European fur traders – mostly French, Scottish and Irish – and local Indigenous people. By 1870, the Métis population in the Red River valley was estimated at 10,000 inhabitants. Westward expansion by the United States became an increasing concern to the Canadian government, and jeopardized Prime Minister John A. Macdonald’s vision of a Canadian nation extending from sea to sea. As a result, the government began a policy of encouraging western immigration, and negotiated with the HBC for the purchase of Rupert’s Land. The threatened influx of new settlers into the region caused fear among the Métis. They saw their way of life endangered, including their French and Roman Catholic heritage, their system of land ownership and governance, and their reliance on the land, including the fur trade and the buffalo hunt. Local anxiety, especially over Métis land rights, led to demands by local people for a voice in creating the terms under which the Red River Colony would be incorporated into Canada. A popularly elected convention, reflecting the settlement's cultural diversity, supported the creation of a provisional government – considered illegal by Ottawa – that was dominated by Louis Riel. Riel's (centre) first provisional government, 1869. 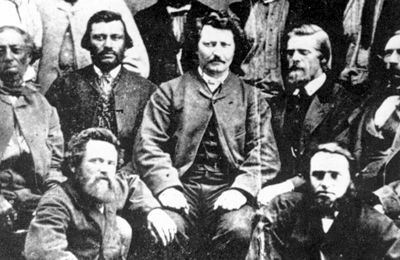 Riel then led the Red River Rebellion against the federal government. During the unrest that followed, Riel's order to execute Thomas Scott deeply divided Canadians along French/English lines, with Riel depicted as either a hero or an outlaw. Many, particularly Protestants from Ontario, wanted Macdonald to take action against the Riel insurgents, however Macdonald chose to negotiate. Three Red River delegates were sent to Ottawa for this purpose. Four successive lists of rights were drafted by the provisional government; the final version became the basis of federal legislation creating Manitoba. The final list demanded that Manitoba be admitted into Confederation as a province, not a territory; that the lieutenant governor of the new province speak both official languages; and that members of the provisional government not face legal consequences for their actions in the Rebellion. The Manitoba Act received royal assent and became law on 12 May 1870. Due to the position of strength of the Métis, and with support by Québec, the Manitoba Act essentially established a Métis province. Macdonald thought the creation of a new province was premature. With its small population and size (Manitoba was then a much smaller piece of geography centred on what is today Winnipeg), the province could not support itself financially. Macdonald's reservations may have also reflected his concerns that the majority of inhabitants in Manitoba did not possess Ontarian or British roots. Despite Macdonald's reluctance, Manitoba entered Canada as a province. English and French-language rights were safeguarded in the new legislature and the courts, as were Protestant and Roman Catholic educational rights. The right to education in either English or French, however, was not protected. Ottawa agreed to pay subsidies to the provincial government, roughly 1,400,000 acres of land were set aside for the Métis, and the province received four seats in the federal Parliament – strong representation considering the small population. Unlike in other provinces at the time, the federal government retained control of Manitoba's natural resources, in particular unallocated land, which was to be sold to support the building of a Pacific railway – which became a magnet for immigration. 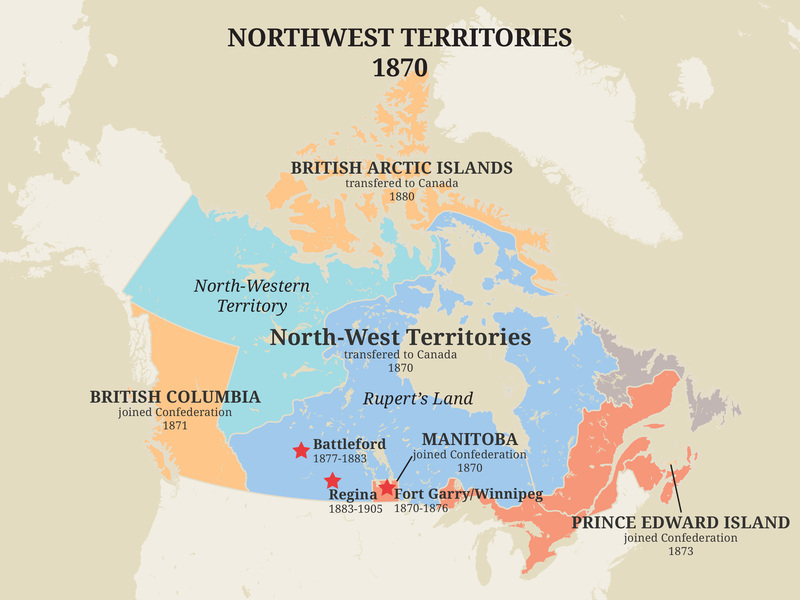 The new province of Manitoba thus entered Confederation as a province unlike the original four. Its creation revealed Ottawa's resolve to control western development. Many of the Manitoba Act's promised benefits were short-lived. Ottawa moved 1,500 troops into the province, and white settlers began to arrive in large numbers. Protestant Ontarians regarded Manitoba as a ‘half-breed’ province, and this spiteful attitude was reflected in future actions. The Métis were not able to acquire their land rights until proper surveying of the land was performed. This took up to three years to complete. In lieu of land, many Métis families were issued scrip entitling them to 64 hectares of land. The scrip was a promissory note on a piece of paper. The Métis had little exposure to the financial and legal systems of eastern Canada, including deeds, money, and written laws. Not knowing the value of the piece of paper, many Métis were cheated out of their entitlement by more savvy speculators. Métis scrip issued for the purchase of dominion lands, 1905. The federal government also passed a number of laws affecting how the Métis land distribution was to take place. 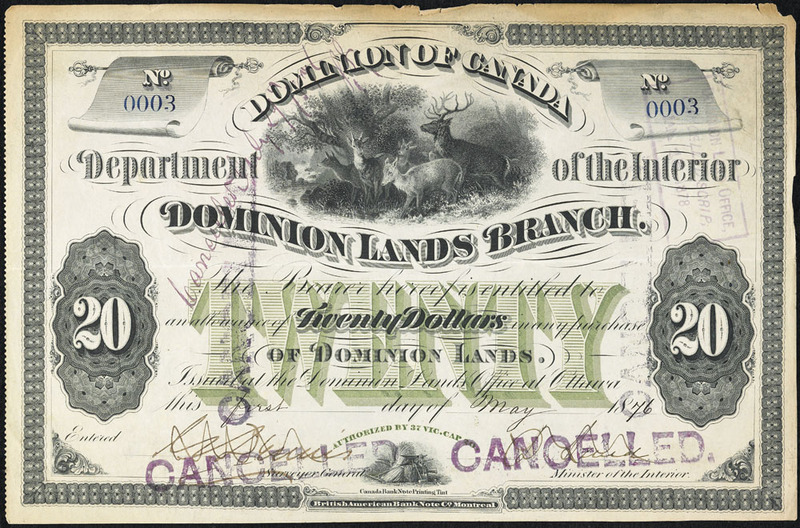 An example is the Dominion Lands Act of 1872 which favoured the occupation of land by newly arrived (non-Métis) settlers. While it is debatable whether Ottawa intentionally impeded the allotment of land grants, or if this was the result of poor administration and lack of competence, the fact remains that as little as 15 per cent of the original 1.4 million acres promised under the Act were ever distributed. Although the bilingual merits of the Manitoba Act would be extended to the remainder of the North-West Territories in 1875, most of these bilingual and bicultural provisions would be abolished between 1890 and 1905, creating a unilingual West. Ultimately, many Metis found themselves migrating further westward in order to pursue and maintain their traditional lifestyle. Many settled in the area of Batoche, in what is today Saskatchewan, which would be the scene of an even bloodier uprising against federal authority in 1885.